MTN NG has introduced a new service called MTNOnDemand. 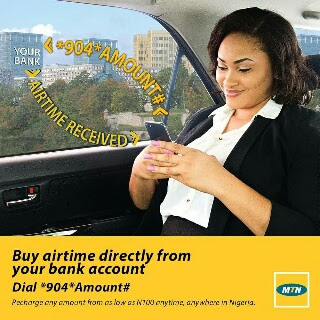 This service allows you to recharge your MTN line from anywhere you might find yourself directly from your bank account. Though there are other channels of which you can recharge your line from; be it Airtel, MTN, 9Mobile or Glo. Take for example, you can recharge any network directly from your Bank account using your bank's mobile app or USSD short code (offline method). I use my bank's mobile app whenever I want to topup my line. I can't even remember the last time i bought a recharge card from a vendor, talk more of scratching a recharge card PIN. This service is designed for only MTN subscribers. If you use any of the banks mentioned above, you can easily topup your MTN line directly from your bank by dialing *904*amount#. NOTE : Make sure your MTN number is linked to the bank account. That's all. Very simple and more convenient. You don't need to switch on your Data before using this service. It's completely offline. You have done well for sharing this information, it will atleast help those who didn't know before but First Bank can also use the code *904*amount# and the bank is not listed above here. This is a very informative post, thanks!! The thing is, I for like to dey transfer credits with online stuff like this but their network issue. Sometimes, it won't send and they will deduct their cut. By the time they will send it, you feel no need am again, cos reason I may want to you online transfer to buy credit is mainly cos of emergency. No. It's for only MTN lines.